A higher incidence of Multidrug-resistant organisms (MDRO) was found in the intensive care unit of Elisabeth Hospital in 2013 and 2014. Clusters of Multidrug-resistant (MDR) Enterobacter cloacae and Citrobacter freundii were found. These samples were taken from sinks in patients’ rooms. After interventions were put in place to disinfect the siphons, the situation seemed under control for a period of 6 months. However, in January 2014, 3 ICU patients were found to be colonised with an identical MDR Enterobacter cloacae. As the screening progressed, it was decided to typify the MDR Citrobacter freundii, colonisations of which were also found in patients. From the period of February 2013 until August 2014, 22 patients were infected with a MDRO. Environmental screening showed that the washbasins were infected with MDRO. This resulted in a set of MDRO procedures. 1. Hand hygiene (renew good practice) 2. Preventive, antiseptic washing of patients with 2% Chlorhexidine Gluconate (chg) washcloths sage 3. Adjusted use of sink in patients’ rooms 4. Isolation in line with regulations of infection control 5. Replacement of siphons in patients’ room; weekly disinfection of siphons with chlorine solution of 300ppm 6. Type and screen of MDRO at admittance and discharge The purpose of the research and the set of measurements put in place was to halt the spread of MDR Enterobacter cloacae and MDR Citrobacter freundii from sink to patient and from patient to patient. The research took place from September 2014 until March 2015. The measurements taken resulted in a halt of the outbreak. Spreading of identical MDRO was no longer detected. The intensive care of the Elisabeth TweeSteden Hospital, in Tilburg, Netherlands is a mixed intensive care. The population consists of medical, general surgical and neuro-surgical patients. The hospital is also the trauma centre for the South West of the Netherlands. It consists of 4 units, 3 identical units with 8 beds each and one unit containing 10 beds for ICU patients not in need of invasive ventilation. All patients are treated in a private room in accordance with the “work island principle” as set up by the inhospital Hygiene and Infection control department. ICU patients are at a greater risk of being contaminated with a hospital-acquired infection due to more frequent need for procedures to be undertaken compared to a ward patient (20 times an hour versus 8 times on a regular ward). Hereby, the risk of contracting an exogenous infection is greater. Outbreaks of hospital-acquired infections have a larger incidence in ICU due to this [1,2]. From May-June 2013, an identical MDR Enterobacter cloacae was isolated from clinical material of 4 patients admitted to the ICU of Elisabeth TweeSteden Hospital, Not only is being colonised with a MDRO harmful to a patient’s health, but it also gives rise to longer stays and an increase in costs . The situation seemed to be under control for 6 months. MDR Enterobacter cloacae were isolated from clinical material again in 4 new patients by January 2014. Although the strains had not been typified yet, it was decided to put in place an Outbreak Management Team (OMT). The isolated MDR Enterobacter cloacae strains were found to be identical to the strains isolated in 2013. During the screening, a relatively large amount of MDR Citrobacter freundii was isolated from both patient material and from the sinks in patient’s rooms. It was therefore decided to typify MDR Citrobacter freundii, Amplified Fragment Length Polymorphism (AFLP). Two clusters were found. Only the sinks were found to be infected with MDRO after thorough environmental screening. A survey of the Consumers Union (commissioned by the Ministry of Economic Affairs) shows that MDRO is apparent on 40% of examined veal and 13% of examined beef. Earlier research shows that almost all chicken meat in Dutch supermarkets is infected with MDRO. It is also known that 8.5% of the Dutch population carries MDRO . It is important to know whether patients are carrying MDROs. It was decided to take a rectal swab from every patient at admittance and release. Fast response was possible by early detection of patients with a community-acquired MDRO. This was achieved for example by following the Infection Control guidelines put in place such as isolating the patient. Possible causes of this outbreak were analysed and resulted in a “MDRO bundle of improvements”. • Type and screen of MDRO cultures at admittance and discharge. A baseline measurement of hand hygiene conform the 5 instances of the WHO was taken before implementing the MDRO bundle of improvements . • Daily assessment of the weaning program. These measures resulted in a reduction of VAPs [8,9]. Two large randomised studies by Climo and Huang revealed a reduction in colonisation of predominant gram positive bacteria MRSA and VRE was shown through the use of 2% Chlorhexidine gluconate (CHG) solution cloths [10,11]. The OMT decided to replace the use of cotton cloths with water and soap via the sink by the 2% CHG cloths. From September 2014 all sinks have been replaced and the MDRO bundle of improvements has been applied. The sinks were cultured weekly for occurrence of MDRO. All staff members were informed about the outbreak and trained to work according to the MDRO set of improvements. AFLP uses restriction enzymes to digest genomic DNA, followed by ligation of adaptors to the sticky ends of the restriction fragments. A subset of the restriction fragments is then selected to be amplified. This selection is achieved by using primers complimentary to the adaptor sequence, the restriction site sequence and a few nucleotides inside the restriction site fragments. The amplified fragments are separated and visualized on denaturing polyacrylamide gels, either through autoradiography or fluorescence methodologies, or via automated capillary sequencing instruments. During the period of research, both hand hygiene compliance and the MDRO set of improvements compliance were measured (Figure 1). 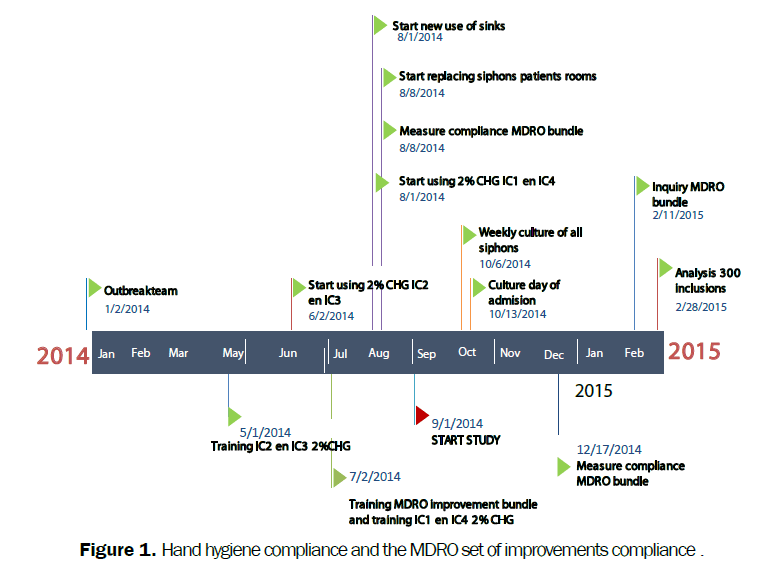 Figure 1: Hand hygiene compliance and the MDRO set of improvements compliance . The importance of good hand hygiene was again highlighted by sending staff members a personal email, putting up posters and starting a campaign. For daily washing of a patient, 2% CHG cloths were used. These are disposable antiseptic cloths with a 2% Chlorhexidine gluconate solution. • After defecation, water and soap was used, to finish, the clean area will be wiped with a 2% CHG cloth. • An extra packet of 2% CHG cloths will be available in the patients’ room when they are being ventilated or are in need of intensive care. There is a distinction between actions that can contaminate the sink and actions that are permissible at the sink. • Using the sink to rinse and clean the inner tube of a tracheostoma. • Using the sink to discard leftover chlorhexidine after oral care. It was decided to daily replace the Yankauer, suction connecting tube, fingertip and suction probe. All patients were treated using the work island principle. Correct use of disposable gloves, gowns and aprons was stressed. Disposable gowns are being replaced every new shift (3/24). Weekly disinfection with a chlorine solution of 300ppm. At admission and discharge of a patient, cultures were taken by taking a rectal swab. By the first of September 2014, all siphons in patients’ rooms had been replaced. All 4 units were using the 2% HCG cloths and all staff members had been informed of the MDRO improvement measures. The figure below shows the total number of isolated MDROs found in the ICU from 2012 (Figure 2). This research shows that from August 2013 until July 2014, 56% of the siphons were contaminated with a MDRO. The results are shown in Figure 3. Figure 3: Environmental testing sinks with MDRO. During the period of the research 1 sink was tested positive once on MDRO. A number of clusters were found; these are shown in Figure 4. The strains isolated from the sinks were classified and were found to be part of these clusters. In total, 22 patients were colonised with MDROs divided over 5 clusters. Figure 4: Number of patients with identical AFLP typing. The difference in the compliance of hand hygiene during these two periods from a compliance from 47% to 80% was investigated using a Chi-squared test, x2 22,5.
p=0,00. This is a significant improvement (Figure 5). Figure 5: Performed actions in the month of august and december. prior to the investigation period, a baseline measurement was performed on the other items of the MDRO bundle of improvement. This measure was repeated in December 2014. (Figure 6 and 7). Figure 6: Baseline measurment august 2014. Figure 7: Baseline measurment august 2014. In February 2015, a survey was conducted. A total of 108 Questionnaires were handed out, of which 91 were returned. This is a compliance of 84.2%. The survey and results are shown in Figure 8. 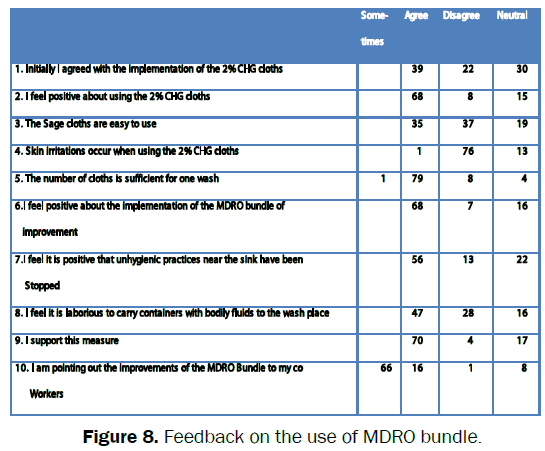 Figure 8: Feedback on the use of MDRO bundle. · 68 of the nurses is positive about the use of the 2% CHG cloths. · Time is gained whilst using the 2% CHG cloths. · No skin irritations occurred after using the 2% CHG cloths. · Over 50% of respondents prefer to use the 2% CHG clothes over cotton re-usable washcloths. · Cleaning the inner tube of a tracheotomy without using the sink is unsanitary and impractical. Our ICU faced a cumulative incidence of MDROs in 2013-2014. Clusters of identical MDR Enterobacter cloacae and MDR Citrobacter freundii were found in different patients. The sinks in different patient rooms were contaminated with different MDROs. As a result we started with a MDRO bundle of improvements. As part of this bundle sinks were replaced, and so eliminating the existing biofilm as source of the transmission of MDROs in our ICU. Although almost no more MDROs were cultured from sinks didn’t mean that no microorganisms were present; Figure 3. The MDRO bundle in total was successful in stopping the further transmission from sinks to patients. No more clusters of identical MDROs classified by AFLP typing after the start; Figure 4. The MDR Citrobacter feundii isolated in 2015 was not part of the cluster. One can’t point out one item responsible for stopping the outbreak of MDROs. This would have necessitated implementing and analysing each of the isolated measures individually. However, the impact of the outbreak was too severe to pursue this route. As part of the MDRO bundle type and screen rectal cultures ad admittance and discharge were taken. The total number of positive cultures with MDROs in 2014 increased as a result of more cultures taken. The outbreak started with predominantly MDR Enterobacter cloacae and MDR Citrobacter freundii species. The total bundle eliminated the transmissions of these MDROs. With the start of rectal cultures ad admittance more community-acquired MDROs MDR Escherichia coli and MDR Klebsiella pneumonia were isolated. Compliance to handhygiene increased to 80%; Figure 5. Compliance to other items of the bundle also increased; Figures 6 and 7. 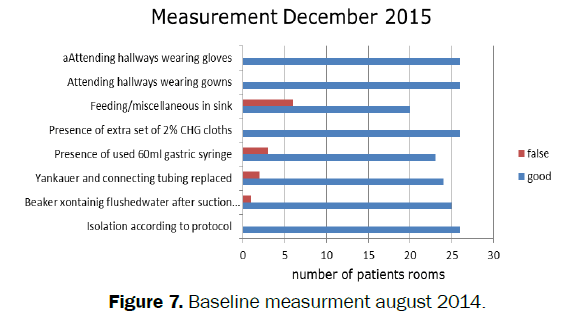 One drawback of these last measurements is the lower number of patient rooms used in August 2014. Time will tell if these high compliance percentages will last. Compliance to cleansing with 2% CHG cloths was almost 100% from the start of introducing the bundle. Initially, implementing the bundle of MDRO improvements met with a lot of resistance from staff, boths doctors and nurses. To come to a positive result, a change in culture was needed, especially for the nurses. The positive results of the MDRO bundle led to this resistance wearing off. 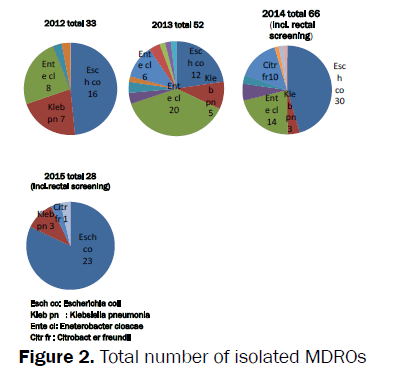 The implementation of the MDRO set of improvements has led to a halt of the spread of identical MDROs from sinks to patients. After the implementation of the MDRO set of improvements, no more patients were colonised with the clusters of identical MDR Enterobacter cloacae and MDR Citrobacter freundii. The outbreak was stopped without the sinks having to be removed from the patient’s rooms. By using the 2% CHG cloths, avoiding washing with water and soap, avoiding using the sink in patients rooms, and not discarding waste through the sinks, patients are now at a much lesser risk of getting contaminated with a hospital-acquired microorganism. Pay continued attention to hand hygiene and the set of improvements to prevent MDRO in future. J.H.Rommes, HK van Saene. Infectie-uitbraken op de IC. Kritiek 2014;4:3-9. A.Kranenburg, ziekenhuishygiënist, onzeLieveVrouweGasthuis, Amsterdam,Werkeilandprincipe: eenvanzelfsprekendeisolatievorm op de IC? Critical Care 2010;5:16-20. Wolf I. The sink as a correctabls source of extended-spectrum-β-lactamase contamination for patiënts in the intensive care. J Hosp Infect. 2014;87. J van Rosmalen, F van Beers, et al. Implementation of a ventilator associated pneumonia (VAP) bundle reduces and costs of sedatives. 2009;22nd ESICM Annual Congress. Susan S Huang, Edward Septimus,et al. Targeted versus Universal Decolonization to Prevent ICU Infection, The New England. Journal of Medicine. 2013:368. Michael W Climo, Deborah S Yokoe, et al. Effect of Daily Chlorhexidine Bathing on Hospital-Acquired Infection.The new Englandjournal of medicine. 2013;533-42.